Many people have disputed me on this but I stand my ground. I’m convinced of it because I’ve seen it all. 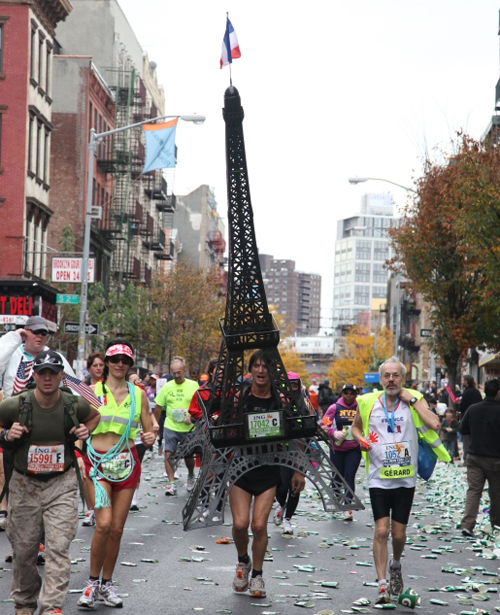 I’ve watched the handicap, the elderly, the obese, the frail, cancer survivors, trauma victims, and even the Eiffel Tower (a long way from home) run the New York marathon. I call him Mr. Eiffel Tower. I saw him at the 2009 ING New York City Marathon carrying his costume to the starting point before he officially put it on. It wasn’t easy for him to carry and probably harder to run inside of it. But he did it. He put his mind to it and viola--Parisian miracle brought to life! In my mind, a miracle is the determination to do an incredible thing and the will to see it through from start to finish, no matter how trying the experience. A miracle is often defined as something that wouldn't ordinarily happen. But the truth is miracles happen everyday. Miracles aren't impossible. They just take work! It’s not impossible to run. I’ve seen people without legs run, the blind and even the sick. I get emotional just thinking about it. There are so many challenged and incredibly brave runners that fill me with amazement, hope and pride in humankind. They may be strangers but when I see them run and hear their stories, they're next of kin. I call them miracle runners because they restore our faith in everything that’s possible. They make you think about what you CAN instead of CAN'T do, and make you itch to do it NOW. This year there are 3 miracles runners that I want to point out to you: Fauja Singh, Jennie Finch and Meb Keflezighi. They're beyond inspiring and their stories will definitely get you thinking about your New Year's Resolutions and how you can achieve something extraordinary and life changing in 2012. You may have heard of a 100-year-old man from northern India who finished the Toronto Marathon in 8 hours, 11 minutes. Well, that’s not even his best time. He’s been running since his 80’s and he’s no slow poke. In 2003 in his nineties, he ran a London and Toronto marathon in under 6 hours. But it’s not about his time or his age. He started running to deal with the loss of his wife and son. It gave him the will to live. He now raises money through his runs to help those in need live as long as he has. If that's not a miracle, I don't know what is. We know her as one hell of a softball player. She’s a 2-time Olympian athlete and one of People Magazine’s most beautiful. But who knew that being pretty could be so irritating? For Jennie it’s always been an issue because she’d rather be noticed for her sport than her looks. And she decided to prove it by going outside her athletic comfort zone to run the 2011 New York Marathon. She started dead last and for every runner she passed Timex donated $1 to the New York Road Runners Youth Program. Jennie passed 30,000 runners that day. Before her run, she told me that one of her goals is to help women find beauty in an active lifestyle. Coming from someone who’s spent a lifetime being beautiful, these words might seem unconvincing. But I realized they were genuine when she talked about wearing USA across her chest at the 2004 Olympics. She wants young girls to dream big because there’s no greater feeling than one of huge accomplishment. Jennie goes beyond role model--she's a miracle-maker. He’s one of the fastest runners in the world, as well as one of the most open-minded. Meb ran this year’s 2011 New York Marathon in Sketchers, and he may not have won but he ran his best time ever. Sketchers isn’t exactly known for making superior running shoes so at first I didn’t quite understand why he teamed up with them. But after chatting with him a bit, I realized that Meb believes in the underdog because he knows what it feels like to be one. He credits running with helping him navigate through many rough patches in his life (including language and cultural barriers when he first moved to the US with his family) and wrote Run To Overcome to encourage others to use running as a way to reach their full potential. Meb really loves his Sketchers GOrun shoes (which are surprisingly sleek) but shoes don’t make miracles happen. People do. All it takes is figuring out a way that works for you to make it a reality. For example, everyone has their own running style and must find their own groove. Once you get the hang of it, knowing that you can run gives you the power to do anything. I know it sounds cheesy, but just accept it! So, back to my point of "anyone can make a miracle happen". Running can make you feel invincible. All 3 miracle runners I've covered above will undoubtedly tell you that. But the not-so-secret-way to become a miracle runner is using that power to make a difference in someone elses life. I recommend making it one of your New Year's Resolutions for 2012. Do a short run for charity or maybe even attempt a marathon. No matter how you choose to do it, consider running for people in need. I promise it'll be one of the greatest miracles you make happen. It all started with Team Continuum and a man named Paul Nicholls. 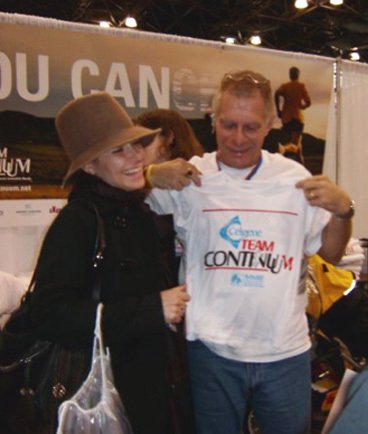 He founded Team Continuum and made me part of it's family (that's us in the pic below the day before one of my NY Marathon races). Paul sadly passed away 2 years ago but he taught me so much about being a miracle runner and ever since, I've had the itch to create change and make the world a better place. Do you want to be a better person? Go farther in life? See the world beyond your scope and find people who inspire you? Then become a miracle runner and MAKE IT HAPPEN. Enter to win the Miracle Runner Starter Kit shown below. One lucky winner will be selected on Dec 13th 2011. But first, I'm going to make you do some work! GIVE Apparel Meaning's amazingly warm & structured hoodie. GIVE is a meaningful brand because they donate 100 liters of clean drinking water for every item sold to the Children's Safe Drinking Water Program. You won't find a more comfortable cold weather hoodie! Check out GIVE's Facebook page HERE! 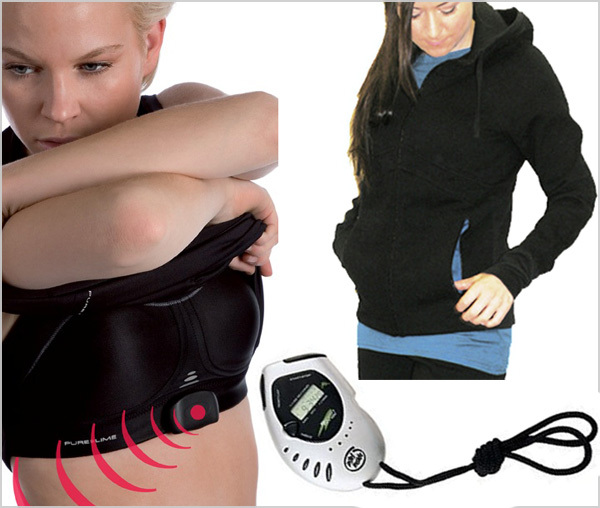 PureLime Compression Sports Bra with a built in heart rate sensor. Just snap your heart rate monitor right on and go! Ergo Sports Timer - perfect for timing your training sprints! Can't wait to read your miracle resolutions! Hi Bianca- great posting with fantastic photos! 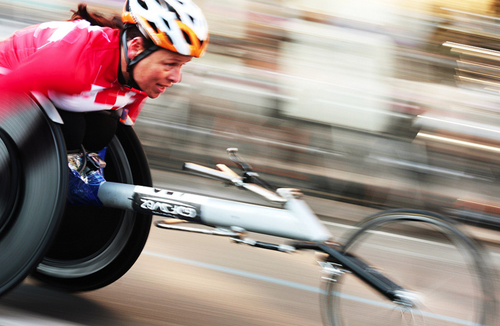 It truly is amazing how many people run the NYC marathon, even with the challenges they face. Every time i have run, or watched, I am amazed by the people who I see pass by. Before I started training for my first marathon in 1998 my mother (who had run two) said to me "if you can run three miles, you could run a marathon." I thought she was nuts at the time, but given the challenges people face who find ways to successfully complete the 26.2 miles, there is definitely truth behind her statement! Mom knows best and speaks the truth. Adidas also says something very similar: IMPOSSIBLE IS NOTHING. There's a superhero in every woman (and some men...just kidding)! Big hug to you, Laura! I'm not a runner - I've been to scared to try. I've been wanted to get at it for a while now so I just printed the C25K program and I'm going to start there! BTW - I love your tweets and FB page. Keep up the great work! Don't be scared! Anyone can run. Just find your own groove. Don't compare yourself to other people or try to match their speed or gait. Just do what works for you. Take breaks and build up. What is the C25K program? Can you share a link about it here? Lastly what size are you? Need to know for every giveaway entry. Thanks for your sweet compliments. This is the official website. You can also go to www.c25k.com for a treadmill version. P.S. I'll inbox you my sizes. My name is Chelsea Rupp and I'm a Crossfit trainer. Ever since I started Crossfit I have not been running nearly as much as I should. My goal for 2012 is to run another marathon. Ooooh a Crossfit-er! So you're quite the hard-bodied tough type, aren't ya? I bet you could lift me to shame. Which I definitely RESPECT! Sounds like you're itching to get back into running, girl! This Running Kit would definitely do the job and help you train for that marathon you're talking about. Where was the last marathon you did and how long ago? Running does a body good...perhaps try running like you Crossfit (super hard, fast and at a high intensity level). Who knows, maybe running will become the perfect complement to your current workout. Thanks for sharing your resolution for 2012, Chelsea! I'm following you on Twitter. I was training for a 5k but then I hurt my knee. My goal is to keep training at the gym and one day get a nice bike and explore. Thanks for the follow! So sorry to hear about your knee but I love how you're not letting this injury get in the way of your fitness dreams. Just keep pushing toward your goals and you will see them come to life. Thanks for entering the giveaway and sharing your resolution with me! I've picked a winner! Congratzz to Chelsea Rupp! I know you're going to love your new Miracle Runner Starter Kit! Please shoot me your details on the MizzFIT.com contact page so that I can send you this prize!